Name your price in USD! Tell us where to send your ebook! You likely know you can save yourself a lot of pain and heartache by learning to let go, but how? How do you let go of anger when your first thought in the morning, the last one at night, and the majority of the ones in between revolve around how you were hurt? How do you let go of resentment when it feels like you’ll never be able to change the things that you resent? How do you let go of frustration when you feel stuck, stagnant, and completely powerless to change it? How do you let go of worries when even the thought of letting them go fills you with worry? And how do you let go of your disappointment with yourself when you try your best to “just let it go” and continually struggle to do it? Letting go is such an abstract concept. What can we do—or not do—to put it into practice, and effectively? I’ve devoted much of the last decade to studying the art of letting go. In this time, I’ve learned a few things that help with all disempowering emotions and a few things to address some of the specific ones that are the most difficult to release. Each section offers a few simple things you can do to release the feelings, come back to the present moment, and find a sense of peace. And best of all, I’ve decided to release this eBook with a “name your price” model. The suggested payment is $5; however, you can pay as little as $1 or give more than that, if you’ve gotten a lot from Tiny Buddha and would like to give more back. 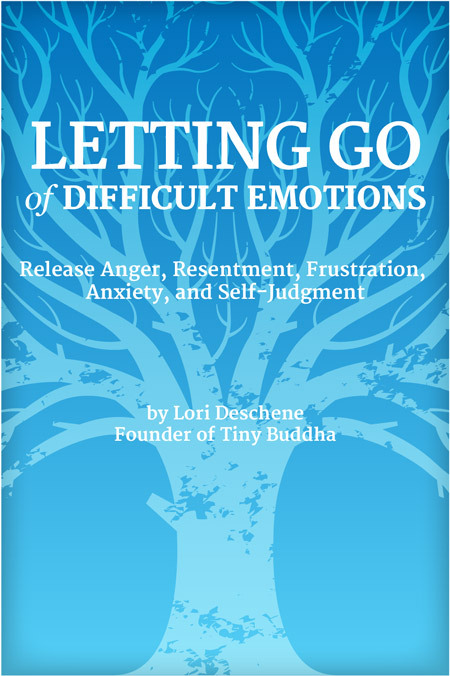 I hope you find this eBook helpful, and I welcome any feedback at email(AT)tinybuddha.com.